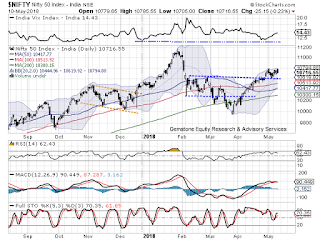 As outlined in our previous note about the importance of the resistance level of 10785, the NIFTY resisted precisely to that level in Thursday’s trade marking the high of 10785.55. NIFTY saw paring 80-points from that level and settled the day with minor loss of 25.15 points or 0.23%. The underperformance was seen more in broader Markets which lose anywhere in the range of 0.40% to 1.89%. As we approach end the week, the NIFTY is going to face stiff resistance to the 10785 mark and this level will be marked as immediate major resistance are for the Markets for the immediate short term. That being said, we would also like to reiterate that with the amount of consolidation that is being seen and the way NIFTY is resisting any major downsides, it is gathering strength for the long run. The levels of 10750 and 10785 will act as immediate resistance area for the Markets. Supports come in at 10685 and 10650 zones. The Relative Strength Index – RSI on the Daily Chart is 62.4278 and it stays neutral against the price showing no divergence. The Daily MACD still remains bullish while trading above its signal line. On the Candles, a black body occurred. Its emergence exactly near the resistance area marks the credibility of the resistance level of 10785. The pattern analysis shows consolidation occurring in the 10650-10785 zones after a breakout from the rectangle formation. If the Markets suffer a complete throw back, the levels of 10500 should act as important support. However, given the resilience that NIFTY is showing to any downsides, we expected this consolidation in a limited range to continue. We believe there is still some room left for such range bound consolidation to continue. It is also important to note that given the fact that NIFTY has remained resilient to any major downsides so far, this should be viewed as underlying strength. We expect such consolidation to continue. Any downsides, if any, shall remain limited and any such down moves should be utilized to make fresh purchases. However, focus is likely to remain on defensive sectors until Markets achieves a fresh breakout. We recommend making select purchases in defensives with each down move but still continue to keep overall positions at moderate levels. Cautious view is advised until the level of 10785 is breached on the upside. Short positions were seen being added in FEDERAL BANK, DISH TV, IDEA, BHEL, JAIN IRRIGATION, SAIL, PFC, PNB, TATA MOTORS, AMBUJA CEMENTS, TATA MOTORS, ASHOK LEYLAND, NTPC and NCC.